Photomosaic is also called photo-tiled picture, which is a large image tapestries made up of many tiny pictures. When watching a photomosaic from afar, you may find it looks just as one clear image, while the inside individual pixels are usually visible when you look closely. Because of this magical character, photomosaic surprised everyone when it was first generated by computer in the mid 90’s, and gradually formed a fashion later on in time. Actually, most of the time photomosaic is a computer-created type of montage, so it is possible for you to make a DIY photomosaic at home. In creating a custom photomosaic, an easy-to-use photo mosaic maker is always in need. 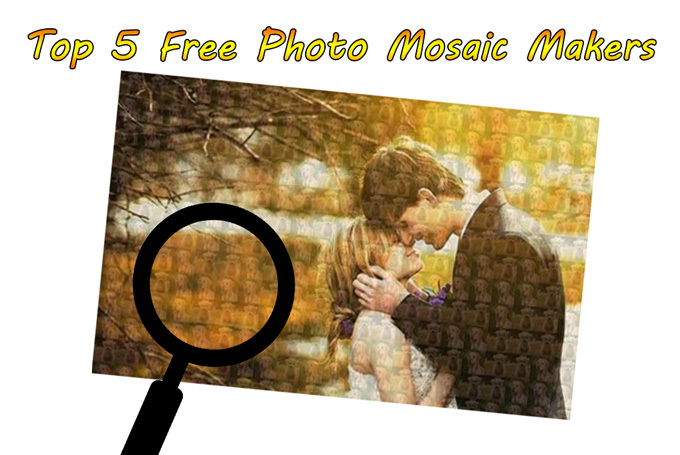 In order to help you with your creation, this post will introduce some great photo mosaic makers to you. 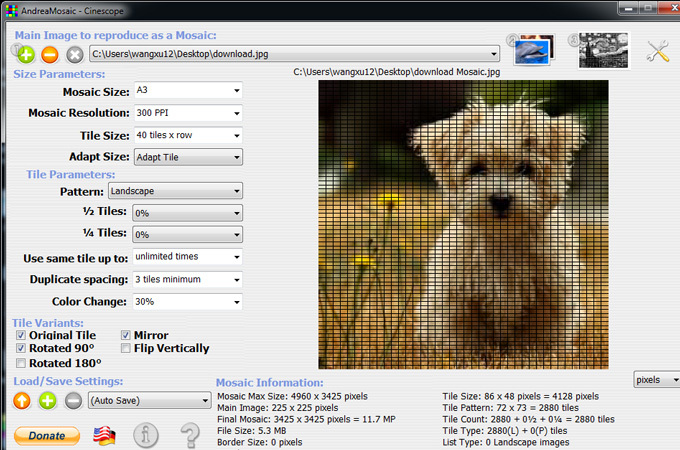 Easymoza is a great free online photomosaic maker, which requires no installation or registration. Easymoza is also good to use for its user-friendly interface, together with tips for selecting photos. It allows users to upload photos and save results in just a few clicks. 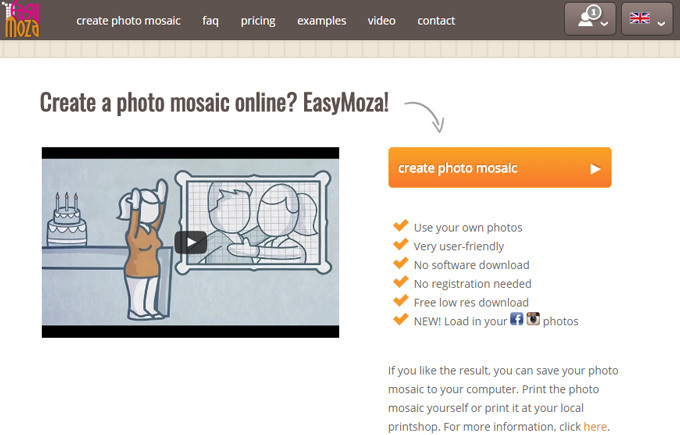 Recommended by Easymoza, you could use a minimum of 50 photos for your mosaic, and by clicking “Select photo”, you could choose to unload a main photo. The main photo is the photo that is composed from all the small photos. If you’d prefer, instead of uploading pictures, you can also choose some photos from the library of 100 flower photos and 100 animal photos. All in all, it is a wonderful photo mosaic maker. As a free online program, PictoSaic allows you to create a stunning photo mosaic within a short period of time, and it will never bring you trouble for it requires no installation or registration during your creating. Compared with Easymoza, PictoSaic provides more detailed information about the photo quality, as well as selections of the number or type of the photos. If you are not willing to unload your private photo, you can also select one from the gallery, and this will not waste you too much time. Try PictoSaic now, and you will find it is a good photo mosaic creator. Being similar to the former two photo mosaic makers, Pixisnap is also a free online tool. With its cool and clear interface, Pixisnap allows users to create their own photos within just three easy steps: choose a mosaic type, upload a photo and customize the mosaic art. Aside from providing step-by-step instructions, Pixisnap also gives users some helpful tips to help you get high-quality results. For example, the recommended minimum size of photo is 320 x 240px and it allows you to upload as many as 20 pictures at the same time. In the interface of this picture mosaic maker, there are two options for users, one is the photo mosaic and the other is the Polaroid tiles. You can choose one from the two according to your preference. 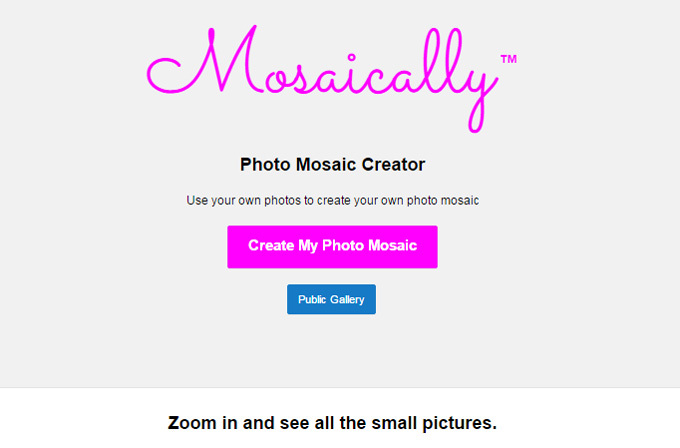 Mosaically is another free online photo mosaic creator, by which you can upload your photos or choose some from the public gallery. Mosaically breaks the mosaic creation process into three simple steps. First choose your big picture from computer, Facebook, Instagram etc. Then upload some small photos. For best result, Mosaically recommends users to add as many pictures as possible (up to 10,000). The finally step is to save the mosaic. Before saving, users can customize the colorization and title size to make it high resolution and zoomable. However, if you want to use this photo mosaic app, you have to create an account first. Though Mosically is totally free, some people still don’t like it for the registration requirement. If you are looking for more powerful software for making photo mosaic, you can try AndreaMosaic. This program features on automatic adjustment, which means when making a photo mosaic, it will automatically help users correct photo color, adjust photo resolution, and crop photos to an appropriate size. 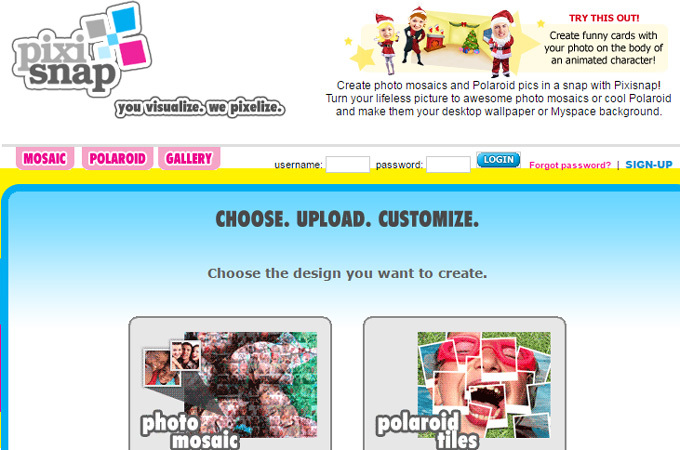 Therefore, users could easily create a stunning custom mosaic by using AndreaMosaic. Though AndreaMosaic is totally free and easy-to-use, it requires installation before you start your creation, and this sometimes will bring inconvenience to you. Whether you need a simple photo mosaic creator, or if you prefer the more powerful program, you could find a satisfactory one from this post. Indeed, all of the mosaic makers suggested above are quite efficient for making photo mosaic, and it’s worth trying out to find the easiest one for you.